OneHumor | Chinese Avengers - OneHumor is a collective of cool content featuring funny videos, funny movies, classic TV ads, virals& silly pictures. Not quite as fearsome a team as the regular Avengers. 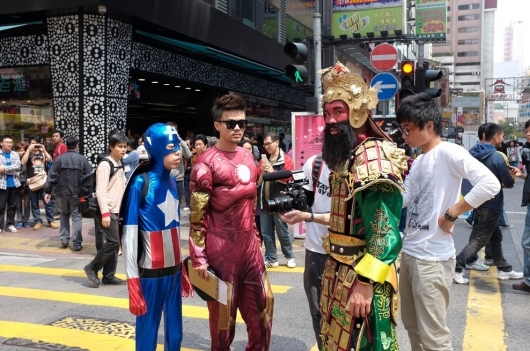 Iron man looks a bit daft but standing next to that guy dressed as Cap he looks like some kind of Greek god. I'd done a poo that was bigger than that guy! Hey.. whatever floats your... uh boat. The horror, the horror of it all. It's a txt message that every sibling has nightmares about, being thrown out of the family home by your mother.... But wait!... This takes a turn for the surreal! Be. Afraid. If you thought Hitchcock's movie The Birds was scay (you wimp), then imagine if they'd had arms, big, bulky, muscular arms that they could slap you across the forehead with. Terrifying stuff. Oh man, this is one of those stories that really tugs at the wrist, you know? You really feel sorry for this poor guy, even though he's purple and his friends are coloured green and a sort of pale pink. Oh cruel earth! It's a devastating travesty that we all suffer with every single evening. Won't someone do something?! It's so, so sad....*WAIT! Who uses a desktop computer anymore anyway? I'm sure Ripley believed what Newt told her but i hate to say it kid but you are WRONG! Sometimes they come during the day and take a seat so near to you that they could steal your hotdog!